It’s clear that people all over the place have no idea how to park and, in some cases, completely lack courtesy. 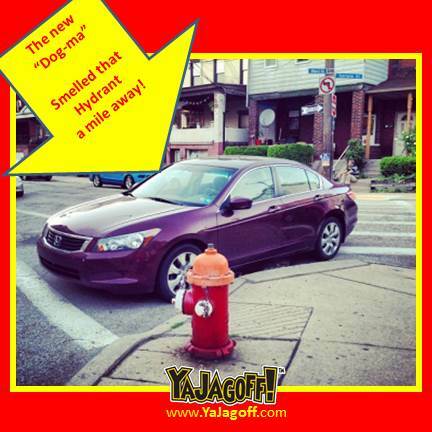 Now pay attention as you go through this because, at the end, we have a new Jagoff Catching Challenge. First up, Dormont. We can just picture this person, doing their best to back into this spot, but, being sooooooooooooooooo bad at backing up, that they zig-zag from left to right 29 times within 7 feet! And, somehow, they end up straight but have no idea where they are on earth in relation to other cars. And what has to be said about the next Jagoff, from Cherry City area, parked in front of a NO PARKING sign and ON TOP of a No Parking sign!!! Really???? I can see their excuse, “ I didn’t see the sign on the ground!” Well, that’s probably right because you’re directly on top of if Ya Jagoff! The pizza delivery guy is training to be a State Trooper in that, he parks HIS car like one… behind the other car, just in case he has to peel out when they make a run for it while he’s giving them a “You Parked Great citation! And now this…..blocking 2 cross walks and one fire hydrant! 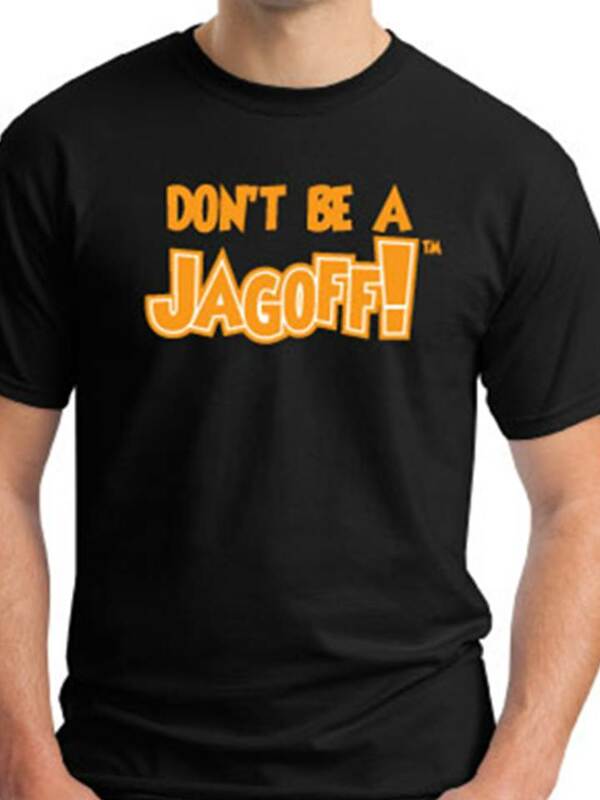 It’s basically the trifecta of Jagoffery! Well, at least I thought so. But then I did some investigating and found out this car model has dog instincts. You can actually shove rawhide bones under the hood every once in a while but you live in hell for the next 24 hours while the car spurts out horrible flatulence! But this one is THEEEEEEE bestest! And the reasons are, it comes all the way from Hawaii AND the Jagoff Catchers “Photobombed” their Peter Parker pic! How awesome that??? It’s their brush with greatness. Sooooo with all of this going on, what are we to do? Clearly blogging about this gets nowhere! Well wait no longer!! Here’s a sample photo that a Facebook follower, Tom Link posted on the wall. It’s a great photo because of the personalized notations. 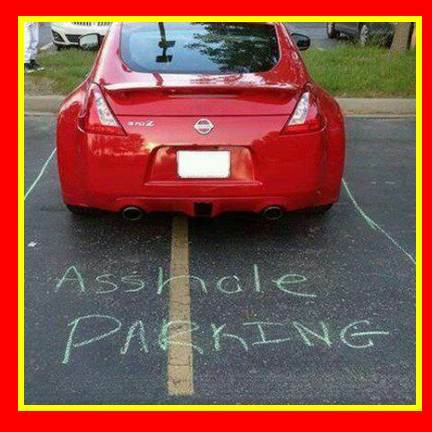 And then THAT gave me an idea… get everyone to start carrying chalk! 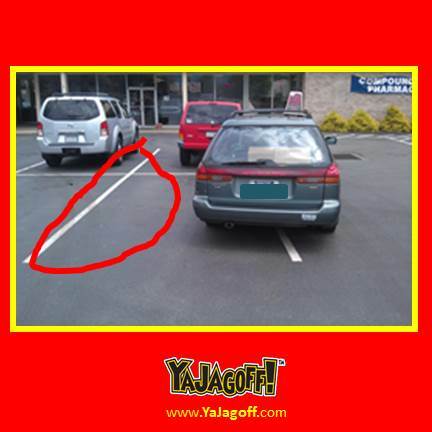 And then, notate the parking space as is simulated by our Jagoff-estrator in the pic below and BOOM!.. there ya have it, smartphone pic for a life time!!! So which one of you will cast the first CHALK STICK???? 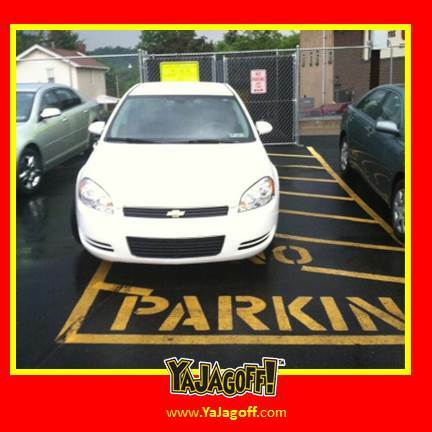 And remember, don’t touch anyone else’s car…. but feel free to draw around it…(no mouth- soap-washing words please. )So the challenge is on. 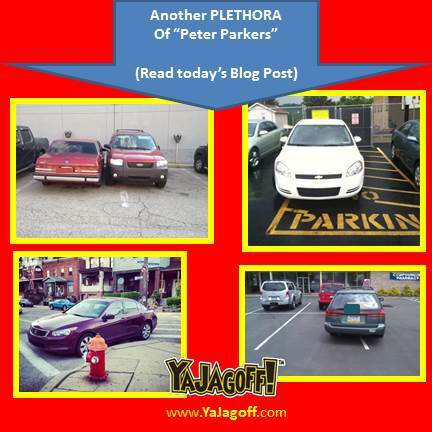 Who will be the first to show a sample of parking lot version of our Jagoffestrator? In the meantime, if you’re a driver that has no clue as to how to park, start taking the bus and get the hell out of OUR way, Ya Jagoffs!! Special thanks to @Spode411 and @nskalos58, (Twitter), Tony Link, Scott B., Colleen F. and her Brother Dan F. (Facebook) and @ndromb, @808norit from Instagram, for being Honorary Jagoff Catchers for today’s blog post!! !